Brian Jeong remembers the frenzy that swept through South Korea this time last year. From coffee shops to fast food joints across the sprawling capital city of Seoul, a new obsession emerged seemingly out of nowhere. And what hype it was. Frustrated by limited investing opportunities in a stagnant economy, angered by hopeless politics, and driven by greed, millions of Koreans hopped aboard the cryptocurrency bandwagon as bitcoin took off on its extraordinary run in late 2017. The momentum was such that, by late December, according to one survey, three out of every 10 salaried workers in Korea had invested in cryptocurrencies. Once a relative crypto backwater, Korea rapidly emerged as one of the world’s largest markets for bitcoin and ethereum, as investors tripped over each other for a piece of the action. 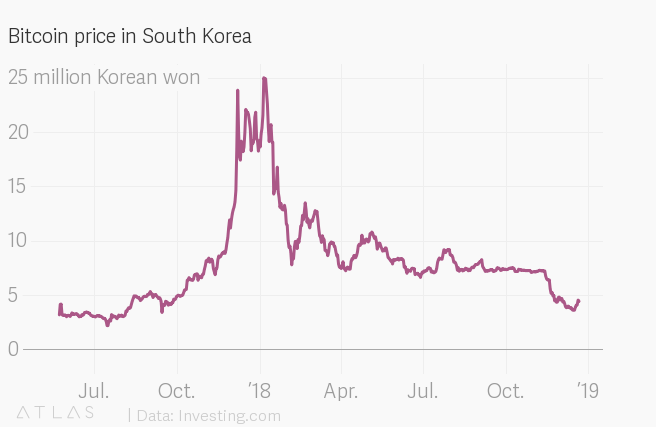 At its peak, the “Kimchi premium”—or the extra that Koreans paid for cryptocurrencies versus global price benchmarks—swelled to 50%. The party ended far more abruptly than it began, as the Korean government, belatedly, swooped in to tamp down on the unregulated speculative frenzy. Tumbling cryptocurrency prices further took the wind out of the market. The mania died quickly, painfully. Yet, from the ashes of the crypto craze, a blockchain boom has emerged. There are already projects underway, backed by heavyweight local businesses, that could bring services built on blockchain platforms into the lives of almost every Korean. Beyond the private sector, government agencies are also embracing distributed ledgers, including a blockchain-based voting system. If successful, these projects would bring blockchain into the mainstream in one of the world’s most advanced economies. Even more notably, this is all taking place in a remarkable regulatory limbo. The Korean government first got to grips with cryptocurrencies, as Park Sung-joon tells it, in late 2016 when the Korea Internet and Security Agency, part of the ministry of science, started studying the ecosystem. “They started speaking to experts,” said Park, head of a blockchain research center at Seoul’s Dongguk University. It was a period of extraordinary political turmoil in Korea, with the impeachment of president Park Geun-hye followed by elections in the summer of 2017, which brought Moon Jae-in to power. Then, starting in May 2017, around the time the Moon administration took office, a series of initial coin offerings (ICOs) in the country drew investor interest, raising millions. To be clear, there wasn’t any legislation enacted, or an explicit policy announced. ‘There’s nothing that says ICOs are banned, but there’s a strong push against ICOs,” said Daniel Lee, a lawyer at law firm Kobre & Kim’s Seoul office, who specializes in cryptocurrency matters. Korean people can dream a happy dream that we’ve never been able to in South Korea, thanks to cryptocurrencies. I might be able to buy a house in a country where it’s very hard to buy a house. I might be able to live a life doing something I want to do. I might be able to take a breath. The new year brought even more regulatory tightening, as KYC and anti-money laundering norms kicked in. Police and tax authorities bolstered their scrutiny of cryptocurrency exchanges, conducting raids to investigate alleged tax evasion, amid a spate of hackings. Korean banks that did business with exchanges also felt the heat. The most effective damper, however, were the markets themselves, as prices went into a dramatic tailspin in 2018. Ordinary Koreans who had poured money into crypto looking to turn a quick profit were left scrambling. Although the FSC introduced a real-name account policy for cryptocurrency trading and guidelines on anti-money laundering using cryptocurrencies, the measures are aimed at minimizing the side effects such as money laundering and tax evasion using cryptocurrencies, not intended for the FSC to directly regulate cryptocurrency exchanges like financial institutions. Simon Kim studied computer science and engineering at the Pohang University of Science and Technology—the Korean equivalent of Caltech—before finding his feet as an angel investor and entrepreneur. In 2017, the 34-year-old convinced six friends, some of them fellow engineers and entrepreneurs, to pool some $700,000 of their money for backing blockchain projects. Simon Kim at Hashed’s offices. Hashed’s holdings include ICON, backed by a subsidiary of the Korean fintech giant Dayli Financial Group, which describes itself as one of the largest blockchain networks in the world. The project is attempting to build a decentralized network that allows independent blockchains to transact with one another without intermediaries. ICON cut its teeth by rolling out the world’s first blockchain-based authentication service for the financial industry. Launched in October 2017, it was built for the Korea Financial Investment Association, a self-regulatory body, serving subsidiaries of major Korean financial institutions. In its early days, the project also built similar private blockchain services for the Korea’s insurance, healthcare, and education sectors. Yet it’s the more recent partnerships that reveal the potential reach of ICON’s platform. In May, ICON announced it was building a blockchain ecosystem, complete with tokens, for Japan’s LINE Corporation, which runs a messaging app with some 200 million users. LINE is owned by Naver Corporation, an internet company that runs Korea’s biggest search engine. Then, in September, ICON unveiled a collaboration with SK Group, one of Korea’s largest conglomerates, to bring blockchain technology to OK Cashbag, a loyalty program that reaches some 37 million Koreans, about 70% of the country’s population. Just a year ago, the focus was elsewhere. “No one cared about blockchain. Everyone’s focus was on cryptocurrency and ICOs,” said Henry Lee, head of global business at ICON. That mania helped create awareness on a massive scale which, in part, led to Korean businesses queuing up to try out blockchain projects. Kakao, a $7 billion internet company that runs South Korea’s largest messaging app, is among those with a newfound interest in blockchain technology. In March, it set up GroundX, a Tokyo-headquartered subsidiary, to develop Klaytn. This platform is targeted at companies with services that could be supported by blockchain but lack the necessary expertise. Klaytn, which is slated go live early next year, has already partnered with at least nine enterprises, spanning sectors from healthcare and gaming to digital advertising and finance. The goal is create a blockchain service suitable for mass adoption that will, at some point, also find use for Kakao’s 50 million users, who are mostly in Korea. Both GroundX and ICON have attracted interest from the Korean government, in a good way. In June, GroundX said it was partnering with an agency of the Seoul metropolitan government to jointly develop blockchain projects for the public sector. Months later, Seoul’s mayor, Park Won-soon, unveiled a five-year-plan, including investments worth over $150 million, to turn the Korean capital into a blockchain hub. ICON, too, is working with the government institutions on multiple initiatives. In late October, it showcased a project allowing users to create an ID card, use it to vote via a smartphone, and be rewarded in cryptocurrency—all powered by blockchain, naturally. The voting system was built under the supervision of the National Election Commission, which has been working with ICON since July to use blockchain to improve candidate registration, voting, and the counting of ballots. But for all the corporate investment and public-private bonhomie around blockchain, the Korean government retains its dislike for cryptocurrency. This complicates things for blockchain projects that rely on tokens to run, even if they are meant to facilitate transactions rather than be used for speculation in their own right. There is little clarity on the official stance for other crucial issues, too, including definitive rules on ICOs and taxation. Individual lawmakers have shown some interest in bringing clarity to the issue, but none of their draft bills have made headway in parliament. The recent slide in cryptocurrency prices has also taken away a sense of urgency. This regulatory uncertainty is creating unease, especially around ICOs that some large blockchain projects are keen to undertake. It’s difficult to say how things will develop from here. Now that the retail markets have cooled off, the Moon administration has much bigger headaches to deal with. The economy, unemployment, and the peace process with North Korea, to name just a few. But with big money and big names getting into blockchain, some expect that there will be clarity sooner than later. The rest of us will have to wait and see.